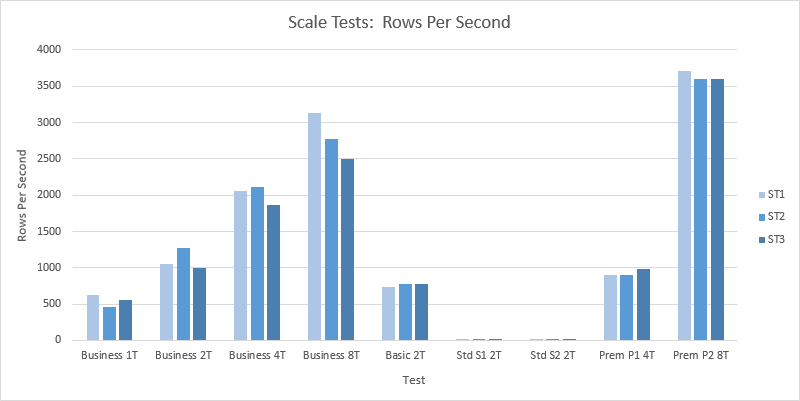 This is the final post from a series of blog posts about my performance tests in Azure SQL Database. For the first post in this series (and links to all of the other posts) please see here. Thanks for reading. I hope the information shared here will be useful in some way. All of the information below reflects the tests that were carried out in July 2014. The prices are also as Microsoft published them in July 2014. For current Performance Metrics, please the current performance test results here (for both the current V11 and the new V12). For initial impressions of the new service tiers and performance information as of July 2014, continue reading. The Sequential Select test involves reading an entire table or tables to get a simple estimate of maximum read rates. The data is read from each table sequentially (i.e. roughly speaking SELECT * with no ORDER BY). Of course, data access at the file level may well not be sequential. The test involves using a newly restored database. The database is sized at 4.5 GB for Web Edition, 10 GB for Business Edition, 2 GB for the Basic Tier and 36 GB for the Standard and Premier tiers. The size of the database and the fact it is newly restored means that none of the data exists in the buffer pool and the test therefore estimates the maximum read rates from physical disk for each tier. Results from the Sequential Select tests are shown in the two charts below. These rates represent the “read-limited” rates, i.e. when the disk read % metric was reporting 100%. In these charts, the “T” values are the number of worker threads generating requests against the database, e.g. “Business 4T” = a test against Business edition, running with 4 threads. As in those earlier tests, the worker threads in the UT tests are not limited to a specified request rate while the worker threads in the LT tests are constrained to generate requests at a limited rate specified in the test definition. The UT tests run against only a small set of test data. This means the entire data set generally exists in the SQL Server Buffer pool (the test table is pre-populated immediately before the test begins). This test therefore primarily investigates write rates combined with read rates from the buffer pool. In contrast to these tests, the later Scale Tests include all of the actions here but acting on data that is not always resident in the buffer pool. Results from the 30 UT tests are shown in the two charts below. In these charts, the “T” values are the number of worker threads generating requests against the database, e.g. “Business 4T” = a test against Business edition, running with 4 threads continuously generating requests. This test combines the activities of the earlier Inserts and Deletes, Direct Selects and Updates tests. Please refer to those posts for a more detailed description of these activities. As in those earlier tests, the worker threads in the UT tests are not limited to a specified request rate. The LT tests were not conducted for this workload. The Inserts test involves calling two different stored procedures – one to insert rows into a test table, another to delete rows. The Cloud Service fires up a number of worker threads as specified in the test definition. The worker threads randomly decide whether to insert or delete (with equal probability). For an insert, the worker thread generates random data to be inserted. Row Id values (the primary key field) are generated sequentially. The worker threads then call a simple stored procedure to insert rows one-by-one (see stored procedure definition at the bottom of the post here). For a delete, the worker thread picks a Row Id (primary key value) at random from an in-memory list of primary key values that exist in the database. The worker thread then calls a simple stored procedure to delete that single row (see stored procedure definition at the bottom of the post here). The worker threads in the UT tests are not limited to a specified request rate. As soon as a stored procedure call has completed another is generated. The worker threads in the LT tests are constrained to generate requests at a limited rate specified in the test definition. The LT tests gradually increase the rate over the course of a number of tests. Both the UT and LT Update tests run against only a small set of test data. This means the entire data set generally exists in the SQL Server Buffer pool (the test table is pre-populated immediately before the test begins). This test therefore primarily investigates write rates. In contrast to these tests, the later Scale Tests include deleting data that is not always resident in the buffer pool. 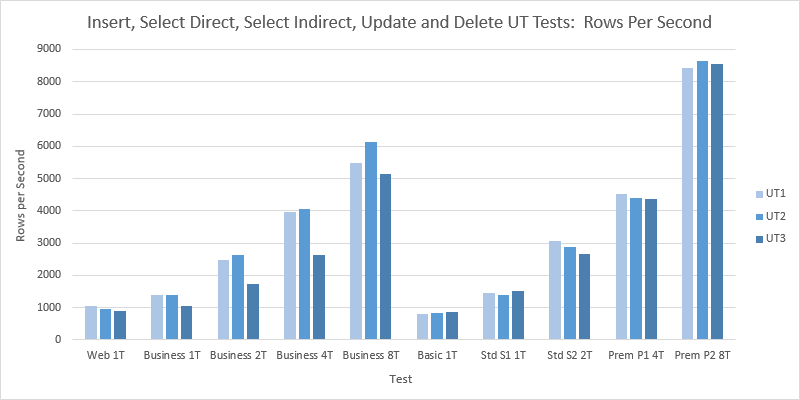 Results from the 30 UT Inserts and Deletes tests are shown in the two charts below. In these charts, the “T” values are the number of worker threads generating requests against the database, e.g. “Business 4T” = a test against Business edition, running with 4 threads continuously generating requests. The Update test involves calling a stored procedure to update single rows in a pre-populated test table. The Cloud Service fires up a number of worker threads as specified in the test definition. Each worker thread picks a Row Id (primary key value) at random from an in-memory list of primary key values that exist in the database. The worker thread generates new values for all fields in the row except the primary key then calls a simple stored procedure to update that single row (see stored procedure definition at the bottom of the post here). The worker threads in the UT tests are not limited to a specified request rate. As soon as an update stored procedure call has completed another is generated. The worker threads in the LT tests are constrained to generate requests at a limited rate specified in the test definition. The LT tests gradually increase the rate over the course of a number of tests. Both the UT and LT Update tests run against only a small set of test data. This means the entire data set generally exists in the SQL Server Buffer pool (the test table is pre-populated immediately before the test begins). This test therefore primarily investigates write rates. In contrast to these tests, the later Scale Tests include updating data that is not always resident in the buffer pool. 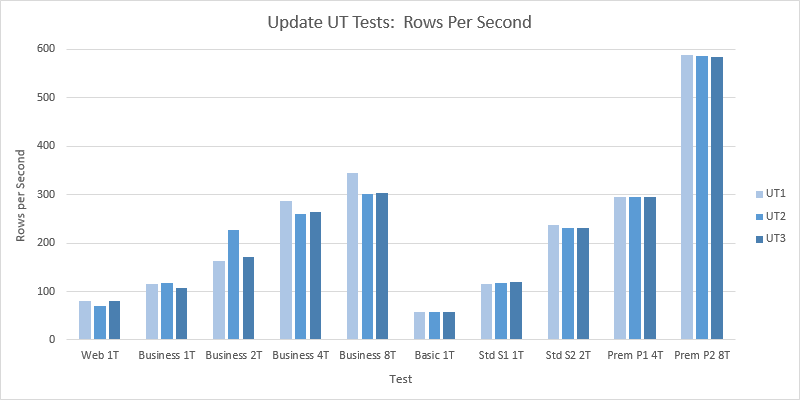 Results from the 30 UT Updates tests are shown in the two charts below. In these charts, the “T” values are the number of worker threads generating requests against the database, e.g. “Business 4T” = a test against Business edition, running with 4 threads continuously generating requests. The Sequential Select test involves reading an entire table or tables to get a simple estimate of maximum read rates. The “Sequential” in the name of the test refers to the nature of the read from the table i.e. roughly speaking SELECT * with no ORDER BY clause – of course this may or may not actually be a sequential read at the file level. This test, the Mini Sequential Selects test, performs the same operation on a much smaller set of data. This means the entire data set generally exists in the SQL Server Buffer pool (the test table is pre-populated immediately before the test begins). This test therefore primarily investigates sequential read rates from the buffer pool. 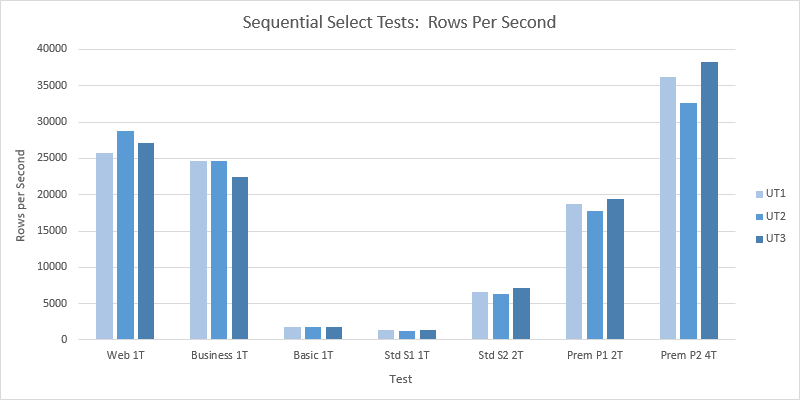 In contrast to these tests, the later (Full) Sequential Select tests, perform the same action against a much larger database for which none of the data is in the buffer pool. As in the earlier tests, the worker threads in the UT tests are not limited to a specified request rate. The data is merely read sequentially repeatedly during the test. No LT tests were performed. 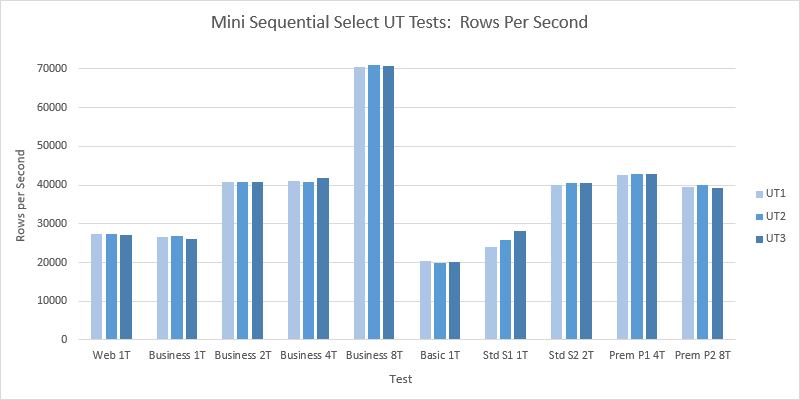 Results from the 30 UT Mini Sequential Select tests are shown in the two charts below. In these charts, the “T” values are the number of worker threads generating requests against the database, e.g. “Business 4T” = a test against Business edition, running with 4 threads continuously generating requests. The Indirect Select test involves executing a text SQL command to select multiple rows from a pre-populated test table. The aim of the test is to investigate performance of a read workload. The worker thread then executes this SQL against the database. So, in summary, each request selects multiple rows by a primary key range – also the clustered index – and by another field – hence the test name “Indirect Select”. As in the Direct Select test, all fields from the test table are returned (roughly speaking “SELECT * “). The worker threads in the UT tests are not limited to a specified request rate. As soon as a SQL call has completed another is generated. The worker threads in the LT tests are constrained to generate requests at a limited rate specified in the test definition. The LT tests gradually increase the rate over the course of a number of tests. 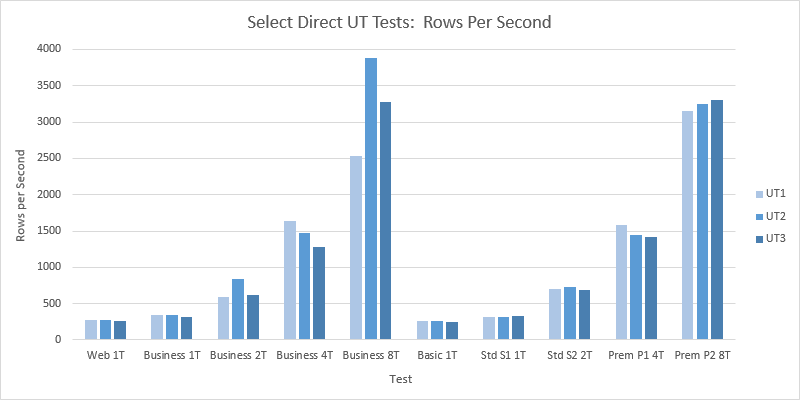 Both the UT and LT Direct Select tests run against only a small set of test data. This means the entire data set generally exists in the SQL Server Buffer pool (the test table is pre-populated immediately before the test begins). This test therefore investigates whether reads from the buffer pool are constrained by edition / service tier. In contrast to these tests, the later Sequential Select and Scale Tests purposefully target reading from the physical disk. 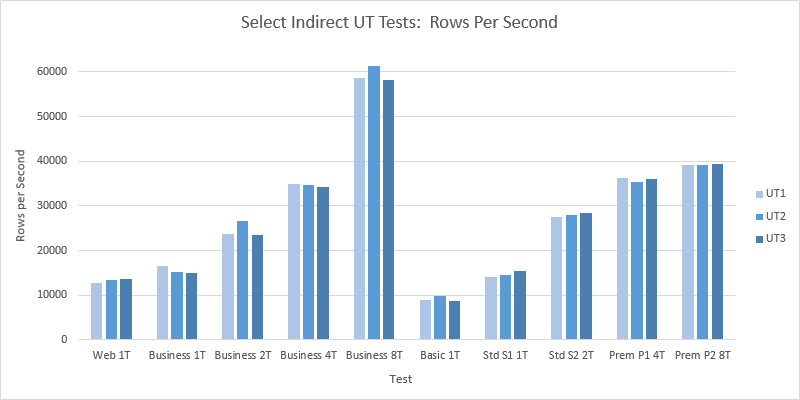 Results from the 30 UT Indirect Select tests are shown in the two charts below. In these charts, the “T” values are the number of worker threads generating requests against the database, e.g. “Business 4T” = a test against Business edition, running with 4 threads continuously generating requests. The Direct Select test involves calling a stored procedure to select single rows from a pre-populated test table. The Cloud Service fires up a number of worker threads as specified in the test definition. Each worker thread picks a Row Id (primary key value) at random from an in-memory list of primary key values that exist in the database. The worker thread then calls a simple stored procedure to select that single row (see stored procedure definition at the bottom of the post here). I.e. each request to the stored procedure directly selects a single row by primary key value – also the clustered index – hence the test name “Direct Select”. The worker threads in the UT tests are not limited to a specified request rate. As soon as a select stored procedure call has completed another is generated. The worker threads in the LT tests are constrained to generate requests at a limited rate specified in the test definition. The LT tests gradually increase the rate over the course of a number of tests. 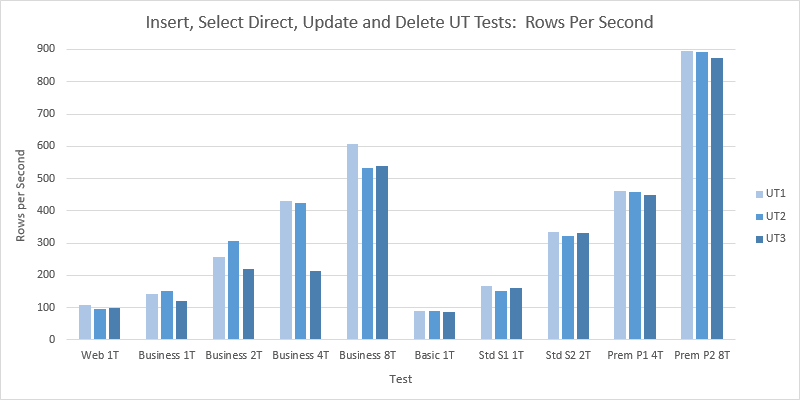 Results from the 30 UT Direct Select tests are shown in the two charts below. In these charts, the “T” values are the number of worker threads generating requests against the database, e.g. “Business 4T” = a test against Business edition, running with 4 threads continuously generating requests.